At the rate 1-10, how do you rate this key chain holder? 10, a perfect gift for everyone! 2, too hard to make. Prefer something simpler. Handmade gift is in fact becoming a trend since most people are trying to save money, reusing and recycling all the different materials that we could find at home. Making handmade gifts at home is an exciting way to gather your friends or family members to join in the fun activity. It doesn’t really matter if the first time result isn’t as beautiful or cute as you had expected because with practice, patience and after you had realized the mistake that you had created, your handmade gift will turn out beautiful during the second time. This article is about the “Alphabet Fabric Keychain Holder” which I had recently sewn. 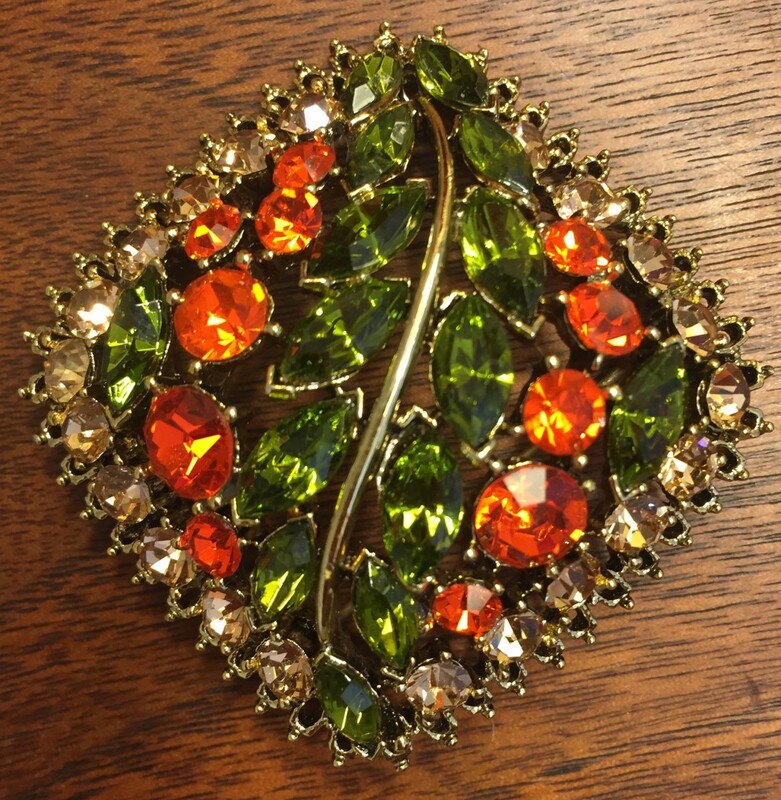 It is the perfect handmade gift for your friends, family members and relatives for all occasion. The wonderful fact about this keychain holder is you are making the alphabet of the person’s Christian name which is especially for him or her. I had self-made a fabric keychain for my niece’s birthday. Kids love to loop keychain with their house keys, schoolbags or handbags. The keychain is a letter “H” alphabet which was her Christian name. 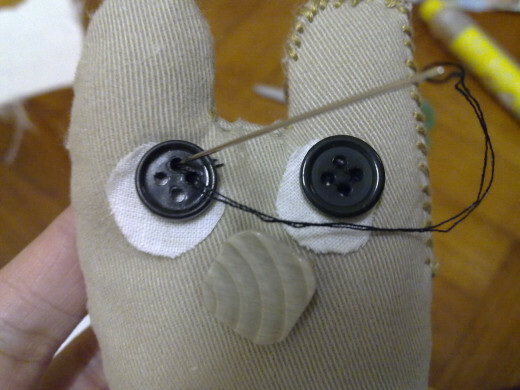 You can choose to use pattern or other colorful fabric that you like and if you could buy those “eye buttons”, they are much convenient as you just have to glue the “eyes” onto the fabric rather than sewing the “eyes”. 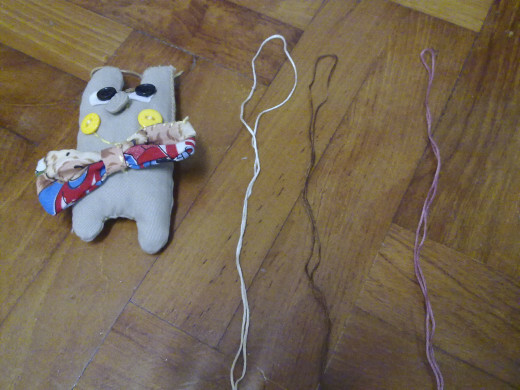 Anyway, after I had sewn the keychain, I realized that I had made a blunder; one of the “H” legs was shorter, looked like a handicapped cartoon character! 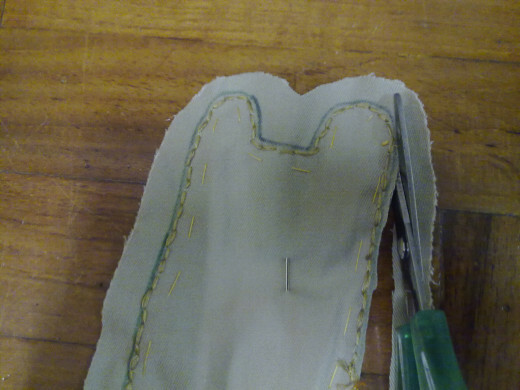 Hence, remember to leave more space of fabric before closing the gap with the last sewing. Let’s get to the step-by-step instructions on how to sew this cute keychain holder. Happy sewing ! 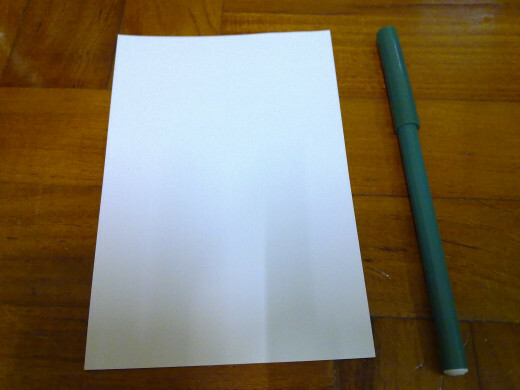 How to draw the letter "H"
Draw a capital letter "H" on the white card with a marker pen. You can draw whatever alphabet that you like as long as it could fits with two eyes, one nose and a mouth. 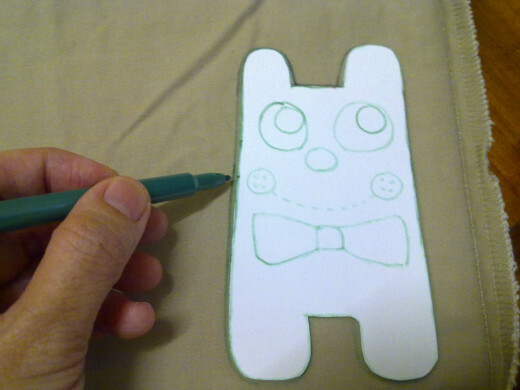 Now draw 2 eyes, a circle nose, 2 round cheeks, dotted smiling mouth and a bow tie. This white card is a sample of keychain design you need to follow later on. Cut out the letter "H" sample. 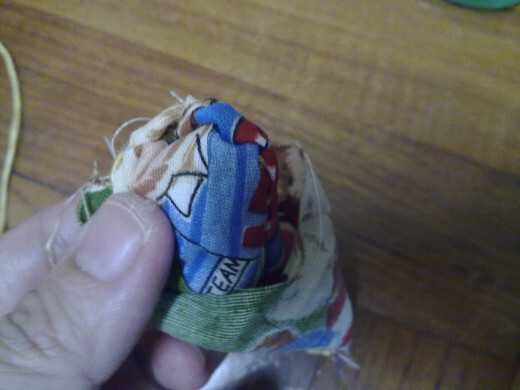 Turn the brown cloth inside portion towards you. The front side will be facing down on the table. 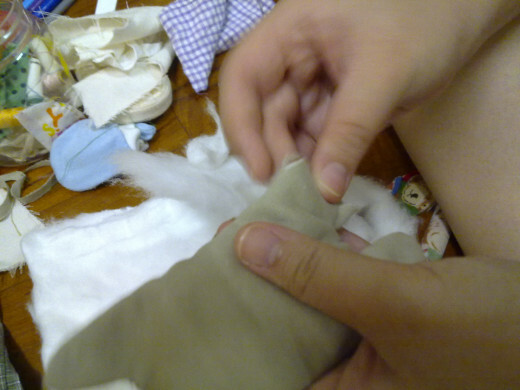 Fold the brown cloth into half. 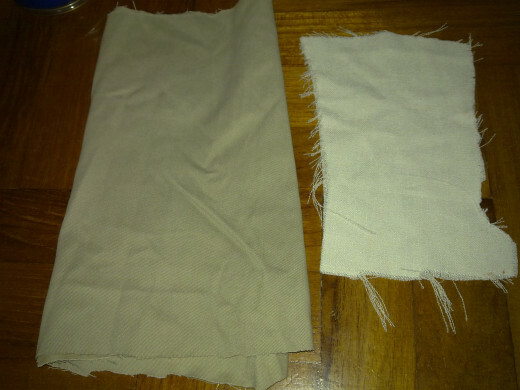 Place the "H" sample on top of the brown cloth. Use a marker to trace out the "H" sample. Just draw the side lines of the letter "H" with a marker pen. 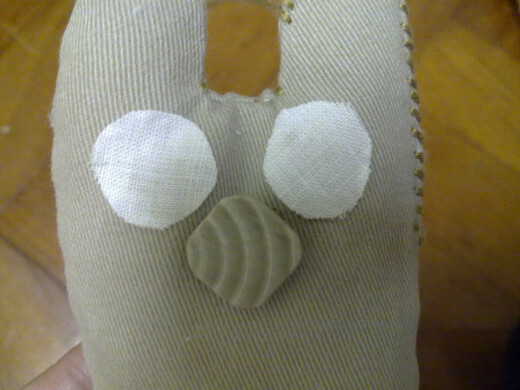 You needn't have to draw the face on the cloth. Remove the “H” sample card. 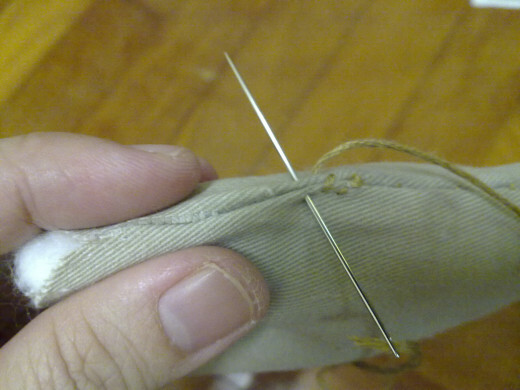 With a sewing needle and thread, sew a temporary stitch along the sidelines of the letter "H" brown cloth. 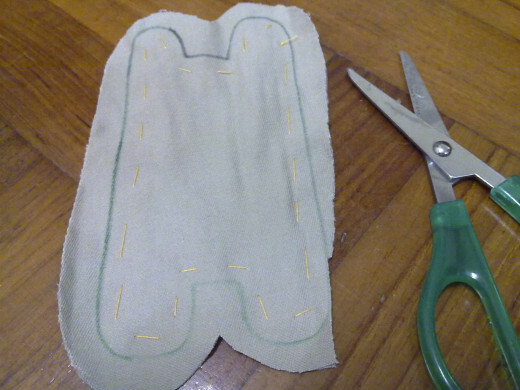 Use a pair of scissors to cut both brown cloths, along the sidelines of letter "H". 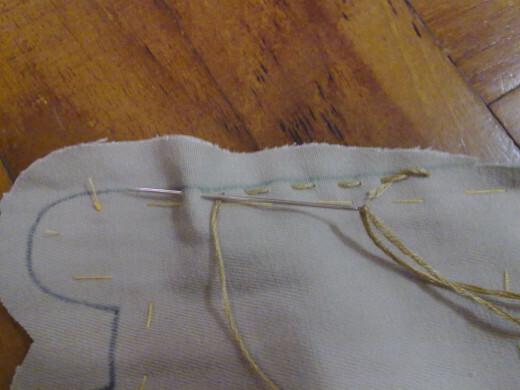 Remember to leave a little space in between the lines as you need to sew the stitch later. Trim the sides. Not too close to the markings. 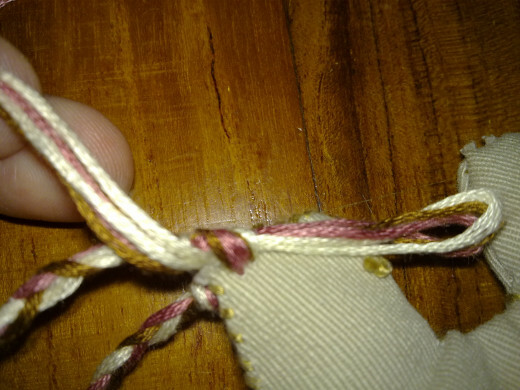 Insert 1 strand of thread through the needle eye and tie both ends together to form 2 strands of threads. 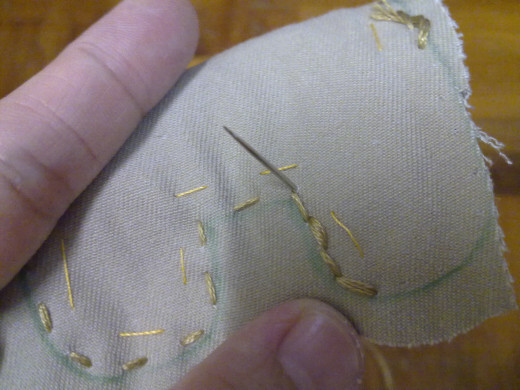 This is the permanent stitch. Sew along the sidelines of the "H" on the brown cloth. Leave a small gap at one of the ends in order to insert the cotton. 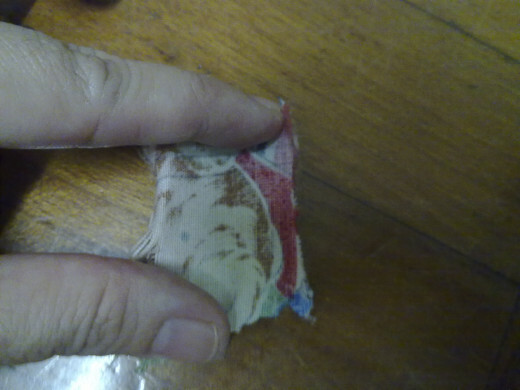 Ensure that the gap is sufficient for your finger to push in the cotton. You will sew up the small gap later on. Sew another set of stitch along the same sidelines. 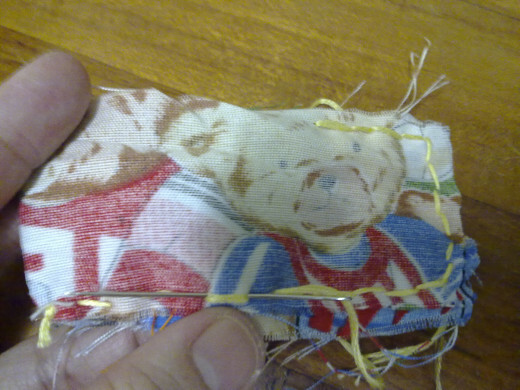 This time sew up the empty spaces from the first stitch. 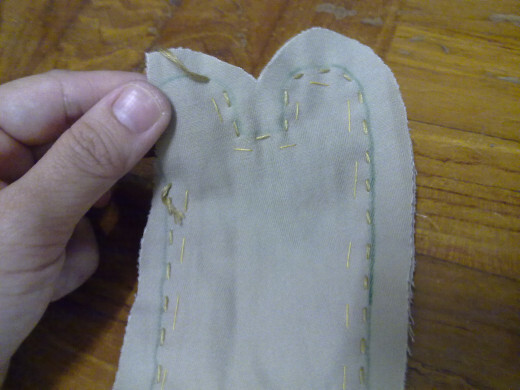 The purpose to sew the stitches twice is to ensure that the cotton does not come out in between the holes. 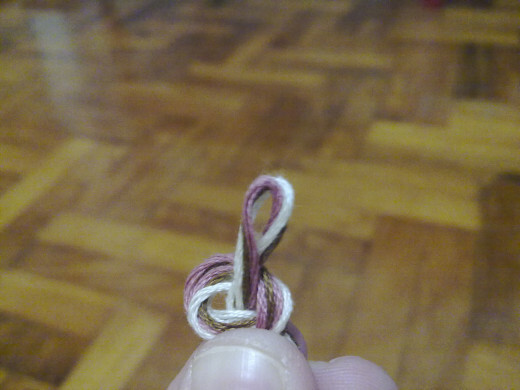 Tie a knot and cut off the threads. Next, trim the excess brown cloth, near the base of the "H" sidelines. Don't trim too close to the stitches. Otherwise the stitches will come off. 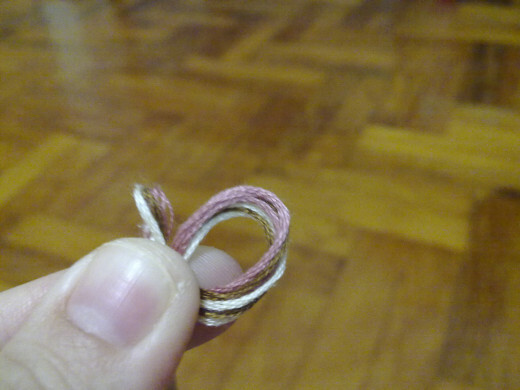 Remove all the temporary threads that you sew earlier. 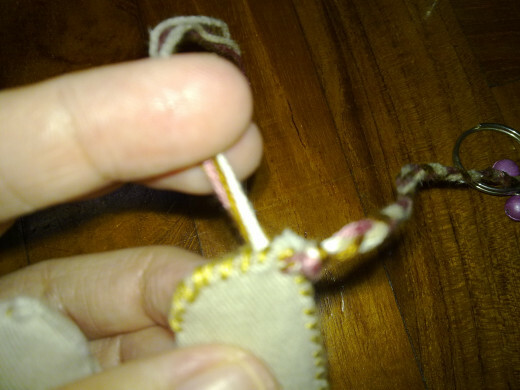 Turn the inside brown cloth outside through the small gap that you had left opened. Push in a little cotton into the gap. 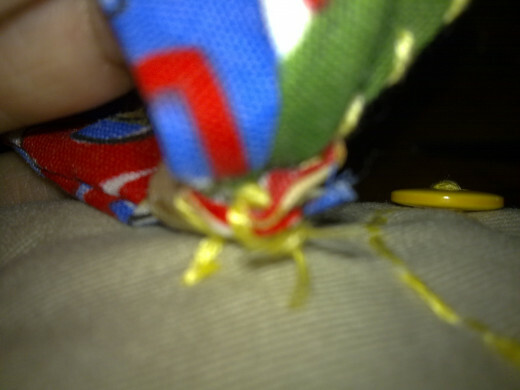 Don't push too much cotton into the "H" keychain as it will be difficult to sew the gap later on. Just push in sufficient cotton to make the "H" keychain looks a little fluffy not plump as a balloon. 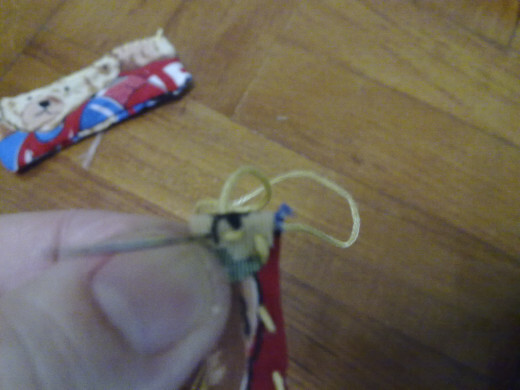 Sew up the gap with 2 strands of threads. Sew it twice so that the cotton doesn't come out. Now your “H” keychain is done. 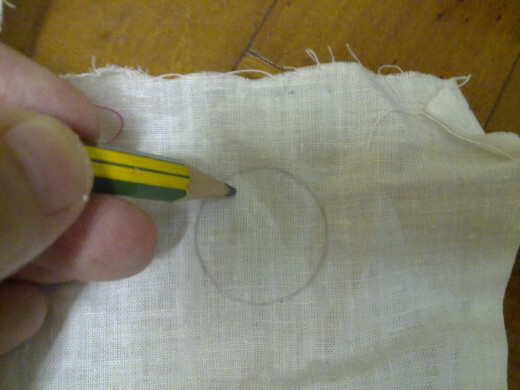 Draw 2 circles approximately 1 inch diameter on the white cloth. Cut out 2 circles for the 2 white eye balls. 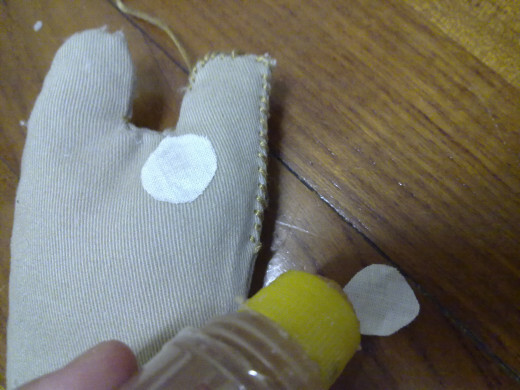 Apply a little glue at the back of each white circle cloths and paste them on the "H"keychain. Follow the location of the eyes that you had drawn on the white card earlier on. Allow the glue to dry on the "H" keychain. 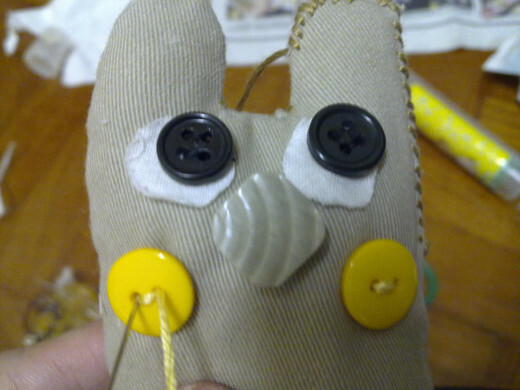 Place a black button on top of the white eye. 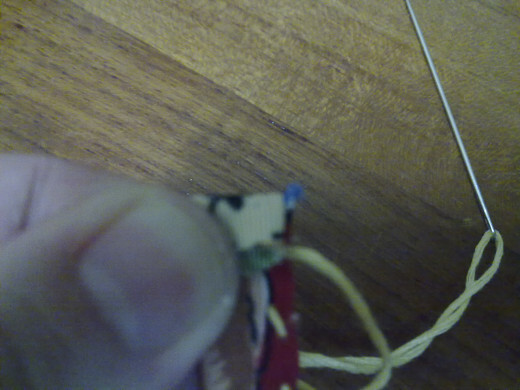 Sew it a few times to make sure that the button does not come off easily. Repeat the same procedure for the other black button on the other eye. 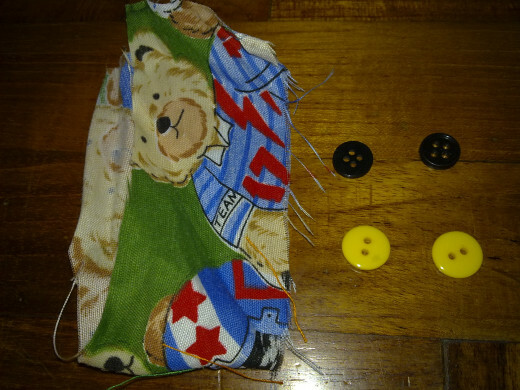 Take a brown button and sew it on to the “H” keychain. 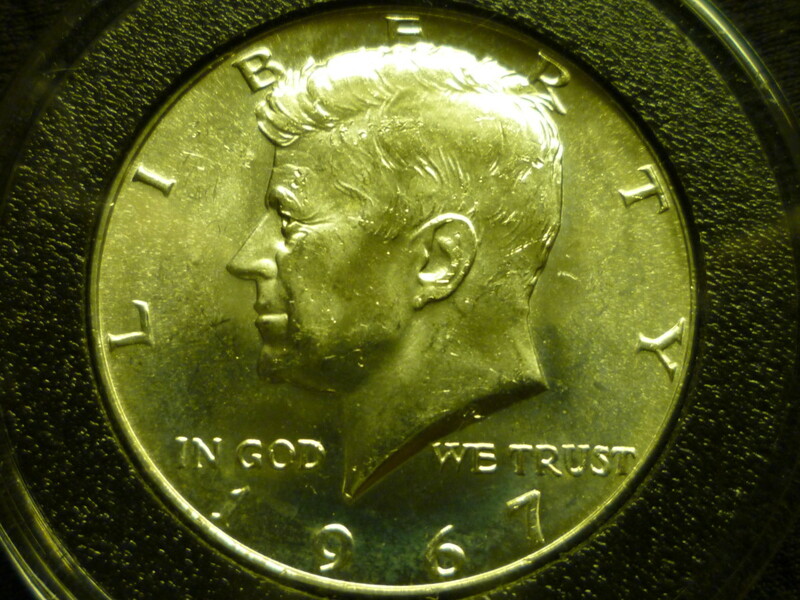 Follow the location of the nose that you had drawn on the “H” sample card earlier on. 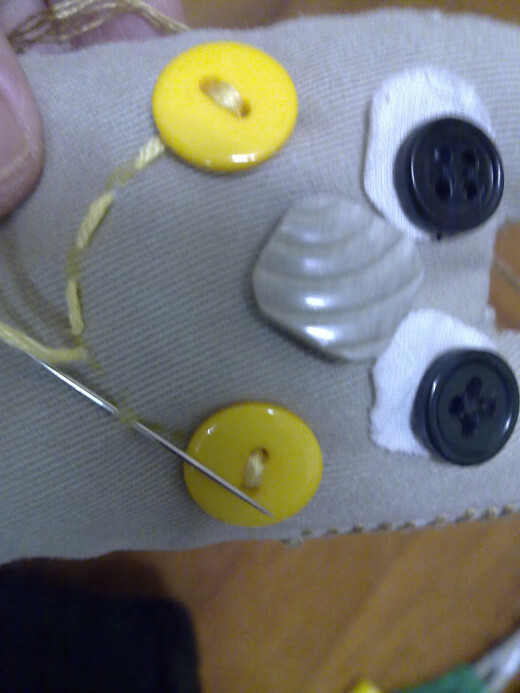 Use yellow thread to sew one yellow button on the left cheek and another on the right cheek. Do not cut off the thread yet. Use a yellow marker to draw the smiling mouth. 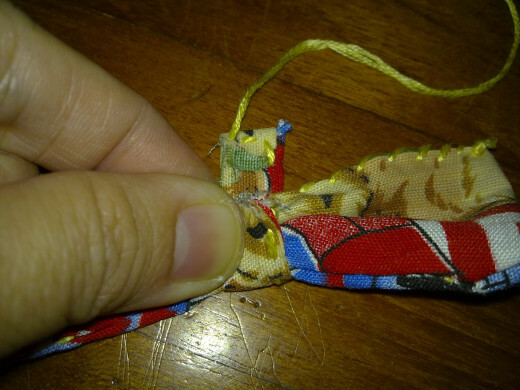 Remember the excess yellow thread that has been left behind? 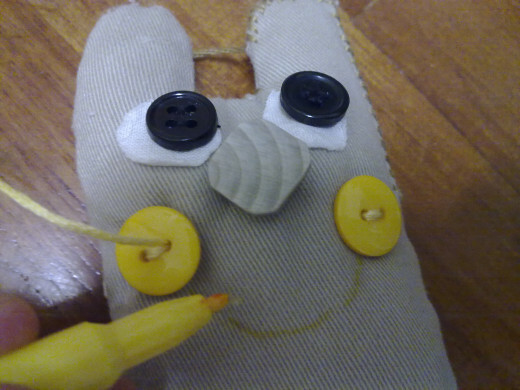 Yes, continue to sew the smiling mouth from your left hand side to the right. The sewing pattern looks like the photo shown, ham and space. 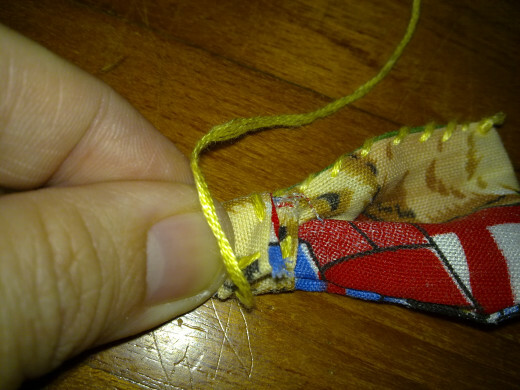 After you have sewn the last ham, swing the thread in a circle around the yellow button, put the needle through the circle and pull up to tie a knot under the button. Sew up the open gap. Turn the inside pattern design cloth towards you and fold it into half. 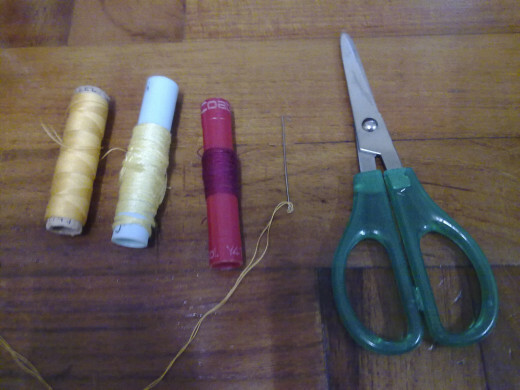 Use 2 strands of yellow thread to sew along the sides. Remember to leave a small gap. 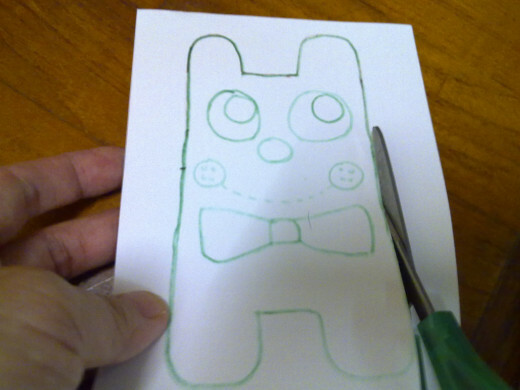 Now, through the gap, use your finger or a pencil to turn the bow tie inside out. 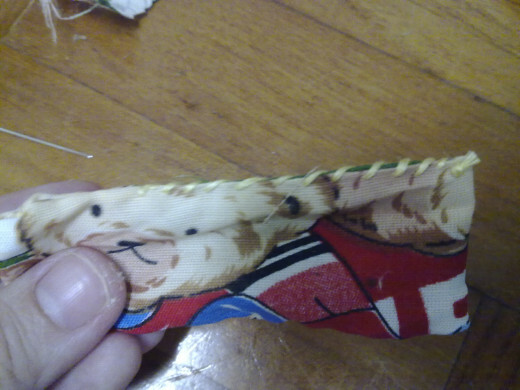 Here, you can see a rectangle shape bow tie. How to make a bow tie. 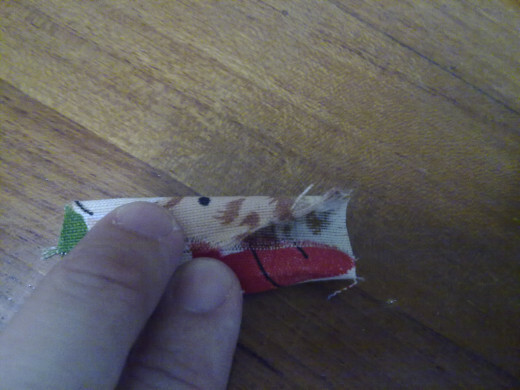 Now, take a small piece of rectangle cloth. Fold in the right hand side and the left hand side too, as photo shown. Fold it into half again. 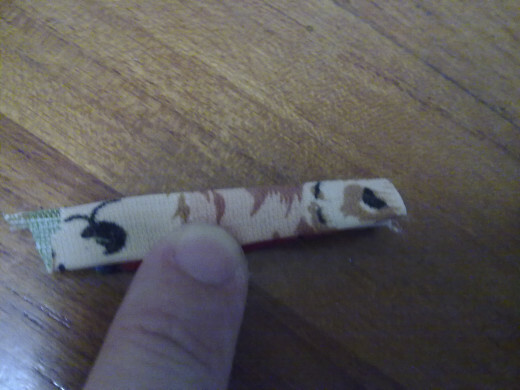 Sew up the opening and the side opening of both side ( see photo shown ). Do not cut off the thread yet. 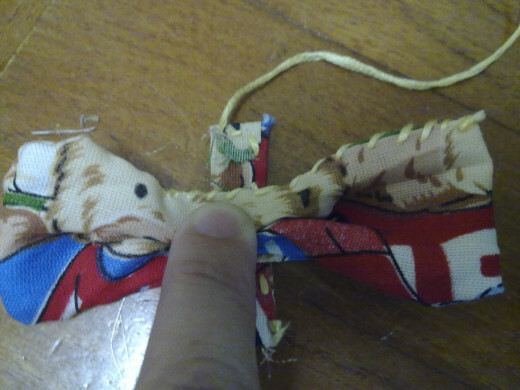 Use your finger to press down the middle part of the bow tie. 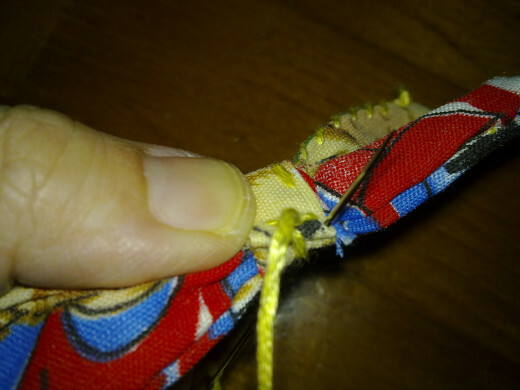 Sew the small piece of rectangle cloth in the middle to tie the middle bow tightly, so that the sides will be expanding out like a butterfly wing. 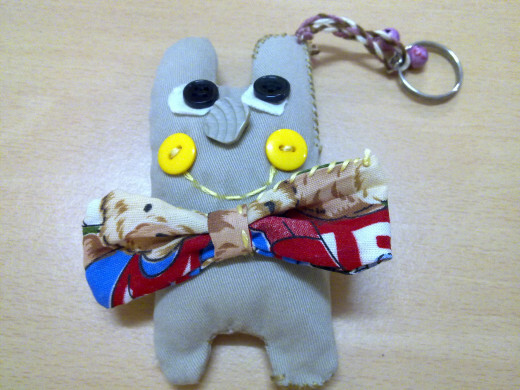 Place the bow tie under the smiling mouth and sew it into the “H” keychain. There are 2 options for you to choose which type of keychain you want it to be. 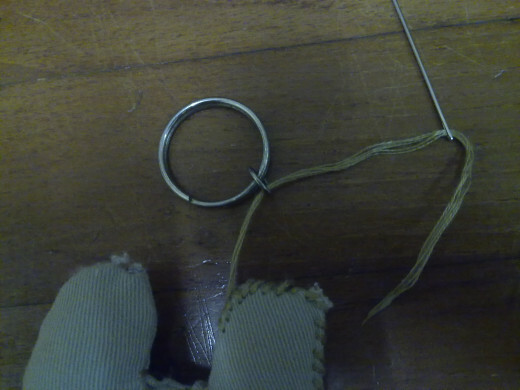 Use DMC thread which comes in 6 floss per strand ( thick enough to hold the key ring onto the “H” keychain) to sew the key ring at the top end “H”keychain. You can choose either the left hand side or the right hand side. It depends which you prefer. Double the length of the “H” keychain. 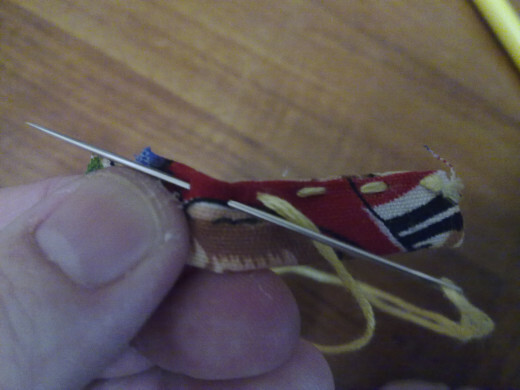 Fold each thread into half. Do you prefer to give handmade or store bought gifts? Why? Store bought. Some are cheap and awesome. Handmade. Comes from my heart. Genuine gifts. After you have tie a braid , remember to leave at least 4-5inch space for sewing purpose. 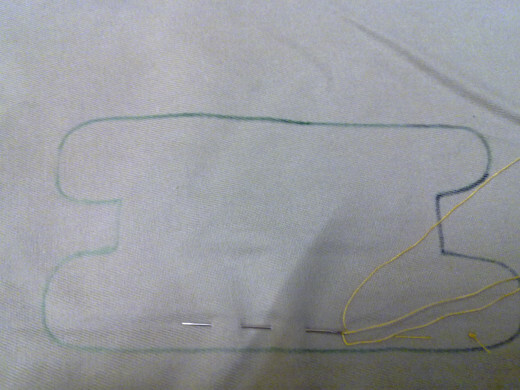 Sew each of the thread into the right / left side of the “H” top end. 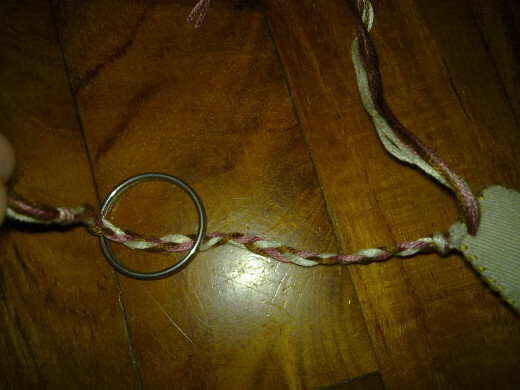 On the other end, loop braided threads through the key ring. Join both ends together and tie a knot. You can add in small “jingle” bells to the keychain to make it special. Yeah, lots of squishy keychains found in the market. Don't have to buy them, just make them with alphabets indicating yr friend's name. Thanks for reading. This is a really cute idea! These squishy keychains seem to be really popular right now, but I haven't seen any that make letters anywhere else. Well done! Glad that you like it. I am sure yr friend will like it vy much! Would make a lovely present for kids and girlfriends. 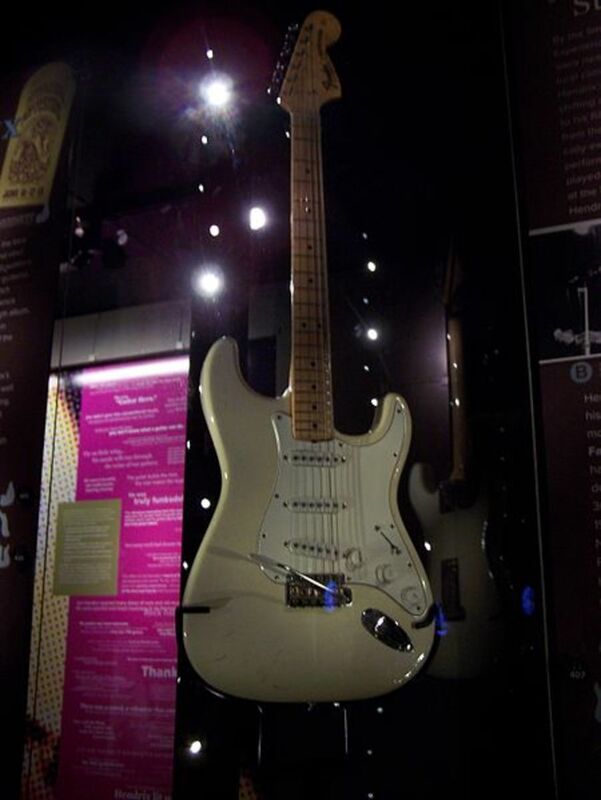 Am looking for Christmas present ideas; this could make the list. Yep, I find it cute too. Squishy too.